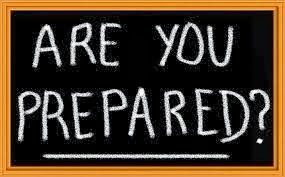 How to Start Prepping - Begin Prepping Now!! The Boyscout motto is ‘Be Prepared’. That’s what each person needs to be. In times past, each family had stores put away to get through the lean times seasonally. If a storm blew in they would have supplies, until they could get out. This is common sense. It has only been in the last 40 years that people have come to rely on the corner mart for daily groceries, and the government to bail them out in a disaster. The first step to prepping is to get your mind set changed. You are capable of making choices that will keep your family safe and healthy in bad times. Or you can make choices that endanger your family in times of peril, and hope someone else will ride in and rescue you. Most people will have to start slowly building supplies, due to finances, but everyone can do it! After you’ve decided that you will do this, roll up your sleeves and START!! You need a 72 hour kit, immediately. This kit should contain enough food and water to keep your family in the house, and comfortable, for three days. Remember that you need enough water to drink, wash hands, wash dishes, and water pets. Buying a couple of cases of water for drinking. Then every time you have an empty juice or soda bottle bigger than a liter, rinse it out and fill it with tap water. Even if this gets stale, it works for pets, washing or boiling to drink. Having it available is the important thing. The second is have enough food to last the three days. Food that can be eaten from the can if needed. Or buy dried food that can be easily re-hydrated with boiled water. Try to think about foods your family will actually eat. Changing diet under stress can cause tummy aches. Try to get some healthy, and some comfort, foods. This is more about changing your shopping habits. If you keep 3 cans of each of the staples you use, and canned alternatives to the fresh veggies, you normally eat. If you do this, you will have enough food in cupboards to hunker down in an emergency. Make sure you have enough blankets or sleeping bags in your home, to keep everyone warm. Remember that you are planning for the worst weather possible, with no heater available, or possibly broken windows. Get an alternative heat source. You need to have a heat source that does not need electricity to function. Electricity is usually the thing that goes out first. wood burning stoves , a propane heater or kerosene heater that you can use inside without venting. One that can be used to cook is a plus. You will have to choose a stove that you can get fuel for it. These steps will keep you family safe and comfy in a bad storm, or short term power outage. This is a great first step to start preparing.